Press Release posted 12/23/16 – The Sierra Madre Police Department is extremely proud to introduce Officer Lara Leduc and Officer Thomas Onderdonk, graduates of the Los Angeles Sheriff’s Department Academy Class 417. Officer Onderdonk graduated as Top Honor Cadet, the highest accomplishment in the class! 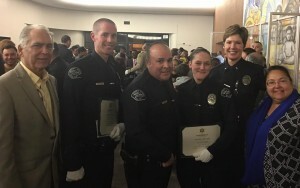 Also pictured (L-R) are City Council member John Capoccia, Officer Onderdonk, Interim Police Chief Joe Ortiz, Officer Leduc, SMPD Lt. Donna Cayson, City Manager Elaine Aguilar. Congratulations officers!